»Personality: Xao is a bright, sarcastic yet relatively composed youth who believes in alternatives. Outgoing and confident in his talents, he looks forward to testing his skills and finding some source of entertainment in each battle. He is quick to judge people based on their appearances and can't restrain himself from letting a snide comment slip, especially with the women he faces. He gets offended when people confuse him for a mere child, telling them that he is a legitimate genius. He is a bit lazier than his comrades, and likes to take naps in his spare time. He treasures small animals, and humors his audience with good cheer. True to his famed reputation, Xao may catch people off-guard with his sudden perceptiveness, noting aloud his acute observations and suspicions without reservations. To keep his audience from shying away, he welcomes them back with a pleasant smile, joke, or chuckle. Sociable and modest as he may seem, Xao can coldly lie, threaten, and kill with the same happy grin plastered onto his lips. In his mind, he convinces himself that he cares only for his book. Nothing is considered too underhanded for his means, and his death is an expected price to pay. In his heart, he knows his civil mask is not a complete act; he does feel guilty betraying others and using people for his schemes. For the sake of his orchestrations, he tries to silence his inner inhibitions. His conduct may be practiced and trained, but he isn't perfect. Mentioning his short stature, his childish refusal to eat bitter foods, or criticizing him of hypocrisy causes him to snap back with his hidden sarcasm and anger. Endangering his friends also sends fearful cracks through his resolve. *Traveling - Exploring new terrain and it seeing its wonder. *Science - His only source of happiness in which he strives to advance in. *Reading - In his spare time, he likes to sit down and read to pass the time when off mission. *Napping - At any moment he feels he has a chance to sleep he finds a spot of comfort and immediately dwells into slumber regardless of the scolding he gets later. *Small Animals - Something he can slightly agree with he thinks of the creatures as pets no matter what the think of him as he watches over them. 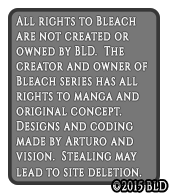 *Burned books - Destroyed Literature is the most evil type of thing he hates done to books, why waste valuable knowledge. *Bullies - Picking on the innocent with no morale reason behind is shameful and disgusting to him. *Bitter Foods - The taste alone causes him to curse at the item as if it could understand him. Xao has Light-Brown eyes and slightly long and shaggy black hair, fair skin and a slight slender builder with a little muscle tone. 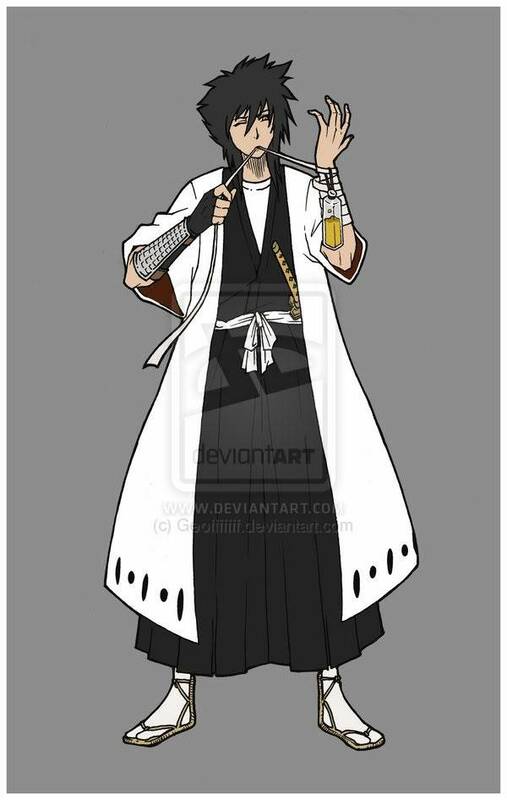 Just like most Most Gotei 13 personnel, He wears the standard Shinigami uniform, called Shihakusho, a white shitagi, a black kosode , a black hakama, a white hakama-himo, white tabi, and waraji. From his Right hand to his forearm he wears a long fingerless black glove, followed by only a steel bracer over it. Upon his left forearm he only wraps a bandage around it and is seen usually attaching some sort of vial in with it. And finally His Zanpakuto secured tightly in his sash as the hilt of his blade can be seen at times sticking out. As far as Xao can tell she must have died as an infant. For he grew up in the farthest part of the Zaraki district. Zaraki is no place for a child many fights break out daily and living is harsh. A young woman by the name of Aya Huojin whom Xao calls Mother took him in and named him. She was the only family Xao has ever known. Aya Huojin was a kind lady how took great care of Xao as if they was flesh and blood. When Xao turned 6, Aya make sure to hold studies every day and had him to help out around the house. In return she would show him the ways of being a swordsman just like her. The older Xao got the harder he studied and the more work he did. Undoubtedly his mother was doing a great job raising him. Xao learn to do many things by the age of 10 that other children seem to have no interest. Which he was fine that none of the other kids wanted him to play with them. Xao much rather work in the garden or write ideas for his little experiments. On a normal night when he was 12 Xao had a strange dream. In this dream, he came face to face with a group of hooded figures that with each foot step shook the earth beneath his feet. He spent the whole night playing with them. Riding on there backs, tossing him in the air, and simply laying down to admire the forest they was in. Just before waking up they gave him some parting words. "This world is most beautiful when you're safe. You see little one you're the ruler of this world and with out you it would all turn to dust. I want you to use my power to keep your self safe and maybe it can bring you some happiness to." The next morning when he awoke tight in his grip was a katana with its blade pressed against his chest. As well the garments he went to sleep in wore no longer on him and had been replaced with black robes. It was Xao's Mother who explained what had transpired. Xao's Zanpakutô had called out to him in the form of a dream pulling him in to the Inner World. Though his mother did have spiritual power, she assumed Xao wouldn't but was happily proven wrong. Normal people do not feel hungry in the soul society. But Xao even as a baby would cry to be fed and on. Xao's Mother had no way of gauging how much power her son possessed but she did know some was there. Now at the age of 20 he was getting used to his Zanpakutô and quite skilled with it. 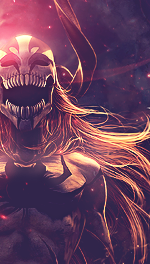 But he lacks another shinigami skills such as Hoho, Kidō, and Hakuda. His mother has since retired from her position in the Gotei 13 and was living her years peacefully. Xao was looking to join Shino academy to further himself as a Shinigami in order to help others. Upon hearing his plea Aya happily kissed her son on the cheek and gave him her word that he'll do fine. Xao indeed was skilled but always was eager to live up to his family's name and reputation. A few months passed by as he was quickly accepted thanks to the recommendation by a former captain. Xao made light work of shino academy, passing all his class and core studies not only at the top ten of his class but with a almost unheard of speed at times. Showing great aptitude in all fields he was quickly was moved up class by class. Showing great physical endurance even with his stature he made it so he can spar with the older students and would stand a chance, and even they could not fully keep up with hi at times. But using the experience and advance skills the teachers taught him only made him more of a threat at times. But the more time he spent with them and learned the ways of Hoho, he became advanced in its art. When it came to Kido he has a surprisingly average start unlike in the more physical aspect of shino academy training.His kido spells had no lack of power but we're a bit unstable. Some of them exploding and some even imploding when he tried to cast them. But he was not lacking in diligence. He made it a point to always ask the teachers for pointers and to help him understand each kido spell. He spent almost all his free time practicing kido if not doing some other form of training. what little was left was spent sleeping and trying to socialize with the other classmen only to be mocked for being a child and the child of a captain which is the only reason he was accepted. After getting down the fundamentals of kido he seem to skyrocket and with the help of teacher and books become able to cast up #90 and showing extremely advanced skills in his castings. There was a small joke amongst the other classmen when they was all told he would be completing his time in the academy soon. The joke being that he would get a Second lieutenant spot right after he left. But like most jokes of this nature they were wrong. But not by much. The Gotei 13 recognizing his academic achievements while in the academy as well as shown a great thirst for knowledge and deep understanding of the worlds sciences gave him a spot where he could beast make use of his skills. They made him Captain of Twelfth Division. Which was with out a Head Officer for a while before him. So he spent most of his time organizing and filling out old paperwork. And finally came the of graduation as he stood the shortest in his class as he was excited and looking around for his mother, only that she was never present during the ceremony as he worried. After graduation he was given a appointed time to report to the First Division Captain to take a test. Unprepared and nervous he showed emotion in sight of the Head Captain and Two other division captains, he was told what he had to do and was give an hour to complete his task. A soft clicking echoed along the long corridors of an empty hall within the barracks of squad twelve in the Gotei 13. The sound continued in simple taps along the marble tiled floors. Click... Click... Click... Click... the sound echoed before come to a complete halt. The sound of a sliding door opening could be heard at the very back of the hallway before the clicking continued. The Brown eyes of the male seemed to be looking over paper work as his hands moved within short reach and grabbed hold of a pen before they began to sign each of the papers before him. If he didn't fill this out, no one would do so for him. "Goodness.. They refuse to give me a break, huh?" Came the voice of the Captain. He stopped writing as the sound of footsteps approached his office, causing him to stop as he waited. A young woman stepped in quickly, bowing her head in respect to the Male and he merely nodded. "Report." You need an appearance description.